At the Supreme Muffler Shop, we believe in providing quality products that will last and perform. One of the brands that we use is the Magnaflow Performance Mufflers. 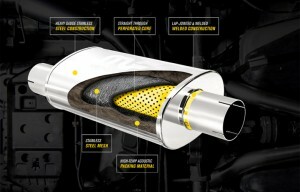 Magnaflow is known for its Quality, Power, and Sound. It was born from a natural desire to build products of the highest quality and performance. The Magnaflow company has a tradition of striving to be the most dependable American-made exhaust products company with over 30 years of experience. MagnaFlow Race Parts are rugged enough to survive grueling races, like the Baja 1000, Lucas Oil Off-Road Racing Series, Dakar Rally, Monster Jam, or even X-Games. Put to the test by drivers like Vaughn Gittin Jr, Casey Currie, Dennis Anderson and Robby Gordon, these parts are tough as nails and give you that performance you’re looking for. MagnaFlow’s specialty race mufflers feature stainless steel bodies, muffler caps and perforated cores, with our straight through, Wide Open Performance design; our mufflers give you that true MagnaFlow performance.